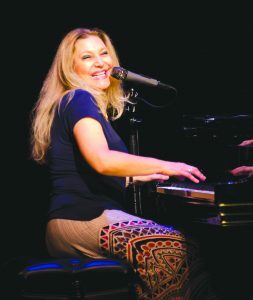 Eliane Elias returns with Music from Man of La Mancha, set for release on April 13, 2018, via Concord Jazz. Recorded with two different trios—one that finds the piano virtuoso accompanied by bassist Eddie Gomez and drummer Jack De-Johnette and the other featuring Marc Johnson on bass with Satoshi Takeishi on drums, with Manolo Badrena joining on percussion—the nine-track collection is a unique all-instrumental reinterpretation of songs from the legendary Broadway musical. Dance of Time, which debuted at number one on two Billboard charts, the iTunes Jazz Albums chart and the Amazon.com Brazilian and Latin Jazz charts, and Made in Brazil, also debuting at number one on the iTunes and Amazon.com Jazz Albums charts, were recorded in Elias’ homeland. The back story for the new release adds another chapter to the prolific pianist-singer-composer-arranger and producer’s résumé: Although Elias has, in the past, recorded tributes to such giants as Antonio Carlos Jobim, Chet Baker and Bill Evans, Music from Man of La Mancha marks the first time she has put her own spin on a specific set of songs from a Broadway musical. Elias’ 26th album in a highly distinguished career, Music from Man of La Mancha was recorded in 1995 and produced by Elias with co-production by Mitch Leigh, the late composer of the music for the original Broadway production.